I don’t think it will be a technology but an experience. And what will “save” journalism might not be the experience of consuming journalism as we know it. This is an ongoing thought that comes from the second (or third) time I met Michael Maness when he was at Ganett and he talked about human centered design and the way people relate to their communities. In short – people relate more to the local businesses they frequent than they do the civic institutions nearby. If you asked me where I lived in Oakland I would tell you “I live across the street from Bakesale Betty’s.” If you lived anywhere in Oakland then you knew exactly where I lived based on this reference. Everybody knows Bakesale Betty’s. The irony, however, is that I also lived across the street from the Temescal Library. Not just any library but a Carnegie library. This is a building designed to be communal and civic. 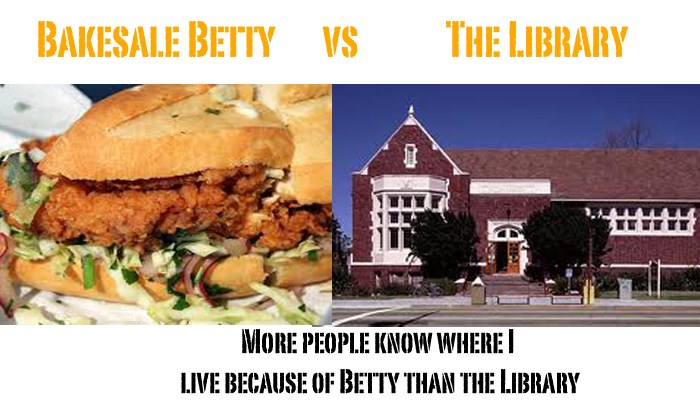 I tested this: If I told you I lived by the Temescal library. I’d get stares and a request for further information. “You know, right by Bakesale Betty’s” – AHHH, I know where you live, they’d respond. A few years later I’ve moved to Berkeley. I now live by a Thai Temple. One would think this would suffer the same fate of the library. It is a communal building. A civic building. Its appeal is seemingly narrow. But every Sunday the Thai Temple serves brunch. Not just a lame brunch. We are talking a four star Yelp brunch (474 reviews!). The first sentence of the first review nails it: “There are no words to describe the sense of community you feel when you go to the Thai Buddhist temple for brunch.” Come for the brunch – be nourished by the sense of community. Civic mission accomplished! When I tell people I live by the Thai Temple they know exactly where I live (although I often have to say “Thai Brunch” for them to REALLY know what I’m talking about). What is saving the Thai Temple isn’t the “Temple” but the experience the community has with it that centers around purchasing food. If that Thai Temple were in peril people would rally behind it, Buddhist or otherwise. Local news organizations need to find their Thai Brunch. So do libraries. In fact, libraries have their “brunch.” What I neglected to mention is that the Temescal library (and the new library I live by in Berkeley) both have extensions that are “tool lending libraries.” In my experiments telling people I lived by the library if I focused on the “tool lending” library people were more likely to know where I lived. It might not be serving their direct “library” mission – but by creating a tool lending center both libraries are more central in the community. Journalism has a value just as libraries do. But that inherent value doesn’t have mass appeal. The question is: Can we find something, a game, an experience, a product whose value proposition draws people in and as a result, brings more attention to the civic value of journalism. Meanwhile – can that game/experience/product create money both to sustain itself and perhaps flow into the journalism. We are still in the early stages of the Spot.Us / Public Insight Network merger, but increasingly this is on my mind. It’s great that people will contribute to specific reporting endeavors. But those who are doing this are perhaps narrow. They are the same people that might give to NPR or any other nonprofit news organization. We want to create an experience that draws people in for something different. It’s an experience that will have significant impact on journalism. That experience will be enabled by technology, true, but that’s not what people will remember or why they’ll get hooked. I don’t know if it’ll come in the next two years and I don’t know 100% what it will look like. But I do think that’s how we’ll define it. *This is not to pick on Betty who everyone knows is awesome, let’s people sell the Street Sheet and/or panhandle right in front of her store. She also gives away free ice lemonade sometimes. So don’t think I’m trying to pick on you Betty – and please continue to hook it up! Great thoughts, Dave! Lots to noodle on. I’ve added this post to my favorites.